If you are looking for an original, typical and quality venue for your next Gala dinner on the Costa del Sol, look no further ! This specialized venue is the perfect place to organize an unforgettable Gala Dinner near Marbella, on the Costa del Sol. The cortijo has its own bullring where you can celebrate this special event, to give it a really personal and Spanish touch. But we also propose indoor typical dining rooms for medium size to very large groups. There is also a very nice andalucia Patio, with many flowers and a central fountain, to take the welcome cocktail, etc. We propose several standard and Gala menus, all being of high quality standards (mediterranean fine cuisine). NOTE : we also feature two indoor rooms for colder months, to allow a real Spanish cortijo/Hacienda dinner, corporate functions and gala dinner. 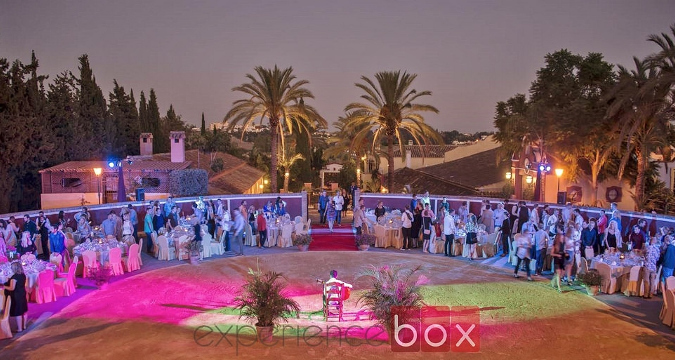 This typical Cortijo venue in the heart of the Costa del Sol is the perfect place to celebrate special events and gala dinners during private and MICE corporate events (incentive trips, conferences and conventions, team building trips, etc). The venue is also ideal for wedding celebrations and special private events. Exclusivity of the entire venue can be organized as an option.